Holiday's are among us and that means lots of food. One dish I've been excited about since I was a small child is mashed potatoes. During Thanksgiving I would return for seconds and sometimes thirds of the creamy, buttery, fluffy mass of goodness until I could eat no more. Once I became vegetarian, I just replaced the turkey with more mashed potatoes and continued my affair. otatoes themselves are high in carbs and starch causing your blood sugar to spike. This explains the addictive characteristic and the sluggish feeling after the apex of the spike. The measure of how quickly your blood sugar spikes after consuming a specific food is the Glycemic Index. Potatoes have the highest glycemic index of any food at 98. White Sugar is at 60 in comparison. Cauliflower offers a surprisingly similar tasty alternative and when mashed with butter or olive oil and garlic it proves a rivaling competitor to mashed potatoes and it equally addictive. Cauliflower has more Vitamin C, Vitamin K, calcium & folate making it nutrient rich and since it has a glycemic index of only 15, your blood sugar won’t be affected. 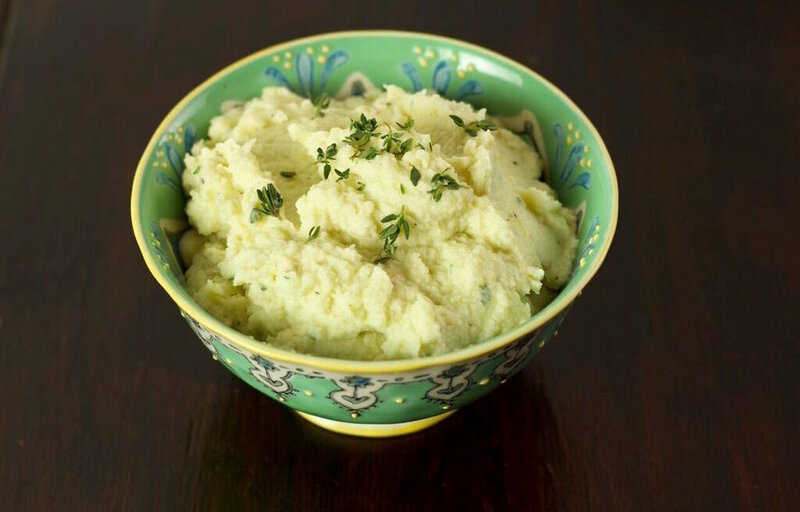 Serve in place of traditional mashed potatoes. Make a complete vegan meal by pairing with my protein packed greek quinoa salad .